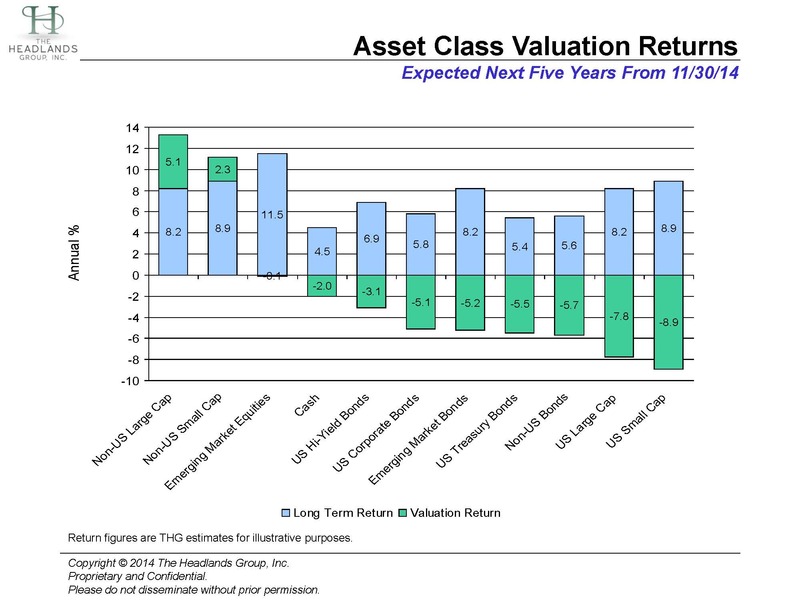 The recent panic selling of oil has had a number of effects on asset class valuations. Direct oil investments are less overvalued than they were. A large percentage of the high yield bond market consists of small energy companies. An increase in their likelihood of default has caused a drop in high yield bond prices, taking the index spread over Treasuries closer to normal. Sovereign bond yields in Europe have hit new lows – mirroring the drop in Treasury bond yields this year. In Europe, weak currencies, low bond yields, aggressive ECB stimulus, and now low oil prices provide a very supportive environment for undervalued local equity markets. Non-US large companies offer the best opportunity for earning valuation returns, with their pricier small cap counterparts offering the second best. At the other end of the spectrum, US small and large cap companies continue to enjoy investor/Fed support and thus offer the least attractive valuation return opportunities. Emerging market equities as a group remain fairly valued, despite a wide disparity in valuations among individual markets. Aggressive world central banks continue to support all risky asset globally, while reducing the attractiveness of government bonds. The current extraordinarily appetite for bond investments globally from central banks, banks and investors means that new bond investors today face significant future losses before they can earn normal returns. Low and high quality credits enjoy the same support as equities. US high yield and investment grade credit spreads are near normal while emerging market spreads are well below normal. Developed market non-US government bonds offer better near term cyclical value despite still overvalued currencies.